Slated for its fourth launch of the year, the Ariane 5 is set to deploy a novel communications satellite with an Inmarsat S-band mobile broadband payload tailored for airborne customers and television broadcasting transponders for the Greek operator Hellas-Sat. 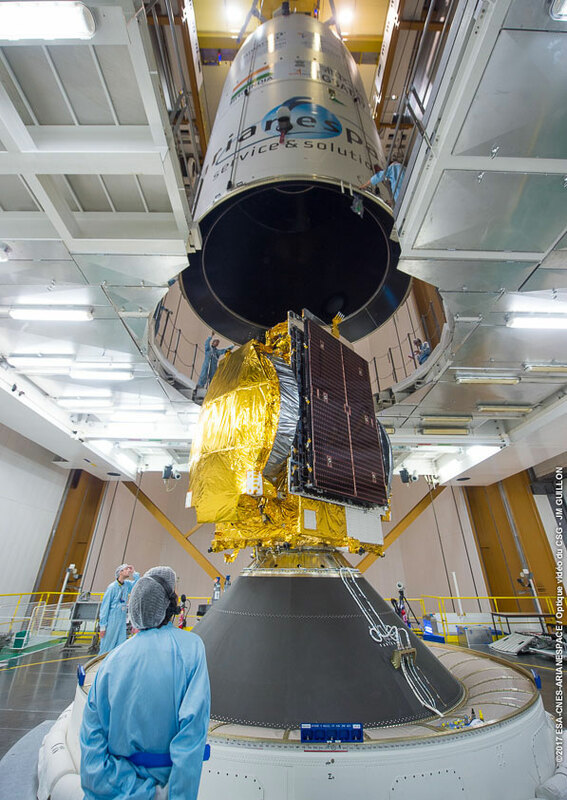 The so-called Hellas-Sat 3/Inmarsat S EAN satellite, built by Thales Alenia Space in France, will ride in the upper position inside the Ariane 5 rocket’s Swiss-made payload fairing. Its co-passenger on Wednesday’s launch is GSAT 17, an Indian communications and data relay spacecraft. Ground teams at the European-run space base in Kourou, French Guiana, rolled the nearly 180-foot-tall (55-meter) Ariane 5 to its ELA-3 launch pad Tuesday morning. 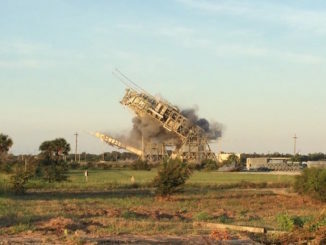 Mounted on a mobile launch platform, the rocket was towed along rail tracks for the 1.7-mile (2.7-kilometer) journey from the spaceport’s final assembly building to the launch zone. The European launcher arrived at the launch pad around midday, and crews spent the afternoon connecting the launch table to the pad’s propellant, electrical and telemetry systems. The launch team also planned to fill the Ariane 5’s high-pressure helium tank Tuesday. The final countdown will commence at 0936 GMT (5:36 a.m. EDT) Wednesday, with clocks at the Guiana Space Center timed for a targeted liftoff at 2059 GMT (4:59 p.m. EDT; 5:59 p.m. French Guiana time). Wednesday’s launch window extends until 2216 GMT (6:16 p.m. EDT; 7:16 p.m. French Guiana time). Electrical systems checks on the Ariane 5 should begin at 1026 GMT (6:26 a.m. EDT). Workers will also put finishing touches on the launch pad, including the closure of doors, removal of safety barriers and configuring fluid lines for fueling. The flight program for Wednesday’s launch will be loaded into the rocket’s computer. 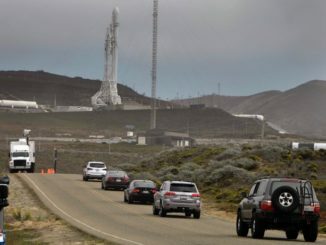 The launch team will begin the process to fuel the rocket with super-cold liquid hydrogen and liquid oxygen propellants around 1621 GMT (12:21 p.m. EDT). First, ground reservoirs will be pressurized, then the fuel lines will be chilled down to condition the plumbing for the flow of super-cold liquid hydrogen and liquid oxygen, which are stored at approximately minus 423 degrees Fahrenheit and minus 298 degrees Fahrenheit, respectively. It will take approximately two hours to fill the Ariane 5 core stage tanks. A similar procedure for the Ariane 5’s cryogenic upper stage will commence at 1741 GMT (1:41 p.m. EDT). Chilldown conditioning of the Vulcain 2 first stage engine will occur at 1731 GMT (1:31 p.m. EDT), and a communications check between the rocket and ground telemetry, tracking and command systems is scheduled for 1944 GMT (3:44 p.m. EDT). A final weather briefing will come at T-minus 10 minues, and then the computer-controlled synchronized countdown sequence will begin seven minutes before launch to pressurize propellant tanks, switch to on-board power and take the rocket’s guidance system to flight mode. The Vulcain 2 engine will ignite as the countdown clock reaches zero, followed by a health check and ignition of the Ariane 5’s solid rocket boosters seven seconds later to send the 1.7 million-pound launcher skyward. Five seconds after blastoff, the rocket will begin pitching east from the ELA-3 launch pad, surpassing the speed of sound less than a minute into the mission. The Ariane 5’s twin solid rocket boosters will jettison 2 minutes, 19 seconds after liftoff. Once above the dense atmosphere, the launcher’s payload fairing will fall away at an altitude of more than 70 miles — about 112 kilometers. The Ariane 5’s first stage will shut down 8 minutes, 52 seconds, after liftoff, followed moments later by stage separation and ignition of the hydrogen-fueled cryogenic HM7B upper stage engine. The rocket’s upper stage will fire more than 16 minutes, accelerating to a velocity of 21,000 mph, or more than 9.3 kilometers per second, to reach an orbit with a planned high point of 35,786 kilometers (22,236 miles), a targeted low point of 250 kilometers (155 miles) and an inclination of 3 degrees. The release of the Hellas-Sat 3/Inmarsat S EAN is scheduled for 28 minutes, 17 seconds, after liftoff. The rocket’s barrel-shaped Sylda 5 dual-payload adapter will be jettisoned a few minutes later. GSAT 17 will separate from the lower portion of the payload stack at 41 minutes, 47 seconds. Wednesday’s mission will mark the 94th flight of an Ariane 5 rocket since it debuted in 1996. 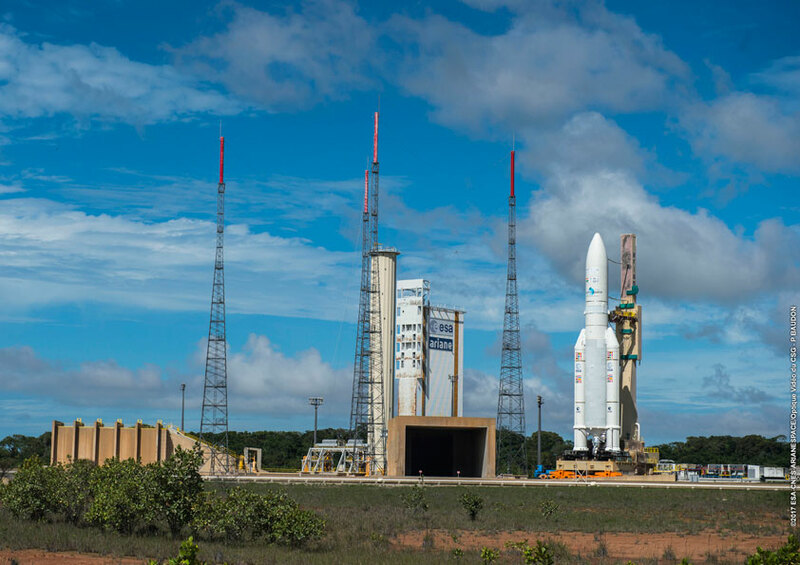 It will be the seventh Arianespace launch so far this year, divided among a roster of launchers that include the Ariane 5, the lightweight solid-fueled Vega, and commercial flights of the Russian Soyuz booster. The two satellites carried into orbit by the Ariane 5 will maneuver in the coming days to their final orbits more than 22,000 miles (nearly 36,000 kilometers) over the equator. The spacecraft, using on-board thrusters, will circularize their orbits and extend their solar panels and antennas before entering service. Hellas-Sat 3/Inmarsat S EAN is heading for a geostationary position at 39 degrees east longitude for a planned 17-year mission. 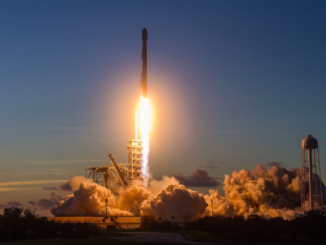 Developed in a cost-sharing “condosat” arrangement by Hellas-Sat and Inmarsat, the 12,742-pound (5,780-kilogram) satellite was originally contracted to launch on SpaceX’s Falcon Heavy rocket in 2016. But delays in SpaceX’s development of the heavy-lift launcher have pushed its maiden flight until at least late this year, prompting Inmarsat and Hellas-Sat in December to switch to an Ariane 5 launch. “It’s been a real win-win for Inmarsat and Hellas-sat to develop this project together,” said Massimiliano Ladovaz, Inmarsat’s vice president of space segment and system architecture. 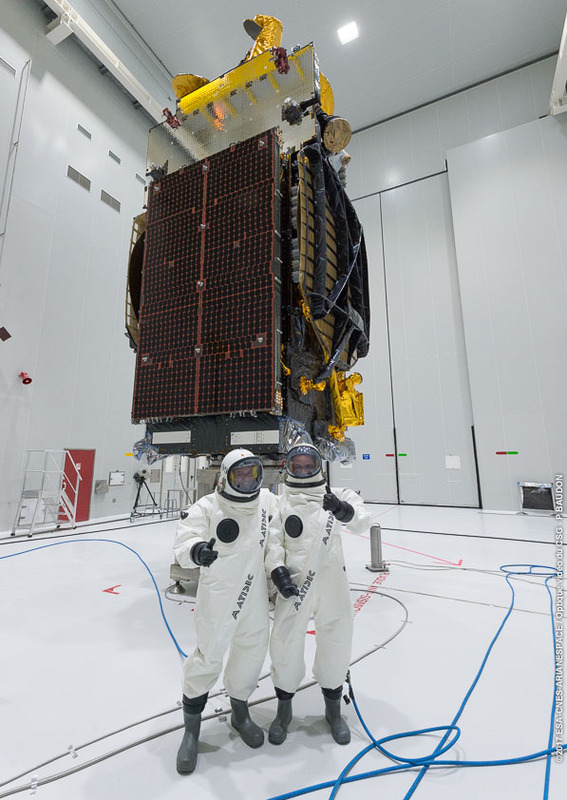 “The spacecraft that was manufactured by a very competent team at Thales Alenia Space in Cannes and Toulouse is a very good example of a ‘condosat,’ where two payloads for two different customers share the same bus. Inmarsat will use its S-band capacity on the spacecraft for WiFi services for airline passengers across Europe, with coverage in all 28 European Union member states, plus Norway and Switzerland. The company calls it the European Aviation Network. The aeronautical communications project is a partnership between Inmarsat and Deutsche Telekom, which provides a network of approximately 300 4G ground sites, allowing a computerized controller aboard aircraft to automatically switch between ground and satellite WiFi service as needed. Coupling satellite- and ground-based broadband for airline passengers will help meet high demand over heavily-trafficked air routes near major European cities. Franci called the S-band aviation network “complementary” to Inmarsat’s Global Xpress fleet, which beams broadband services to airplanes, ships and other on-the-go customers around the world. While Global Xpress is suited to remote regions, the European Aviation Network is designed to serve clients in congested parts of Europe. The Hellas-Sat 3 portion of the spacecraft will replace coverage currently offered by the Hellas-Sat 2 satellite launched by an Atlas 5 rocket in May 2003. Hellas-Sat, a Greek subsidiary of Saudi Arabia’s Arabsat, owns 44 Ku-band transponders and a single Ka-band transponder on the satellite. Harry Iordanou, Hellas-Sat 3 project manager, said the satellite “will be Hellas-Sat’s second satellite at 39 degrees east delivering in-orbit, direct-to-home, and telecom services over its coverage areas in Europe, the Middle East and sub-Saharan African countries. “Its activation will not only maintain but also expand Hellas-Sat’s business reach with additional capacity, while bringing video content in high and ultra-high definition format,” Iordanou said. The satellite’s initial orbit-raising maneuvers and deployments will be controlled from Thales Alenia Space’s center in Cannes, while in-orbit testing and commercial operations will be managed from a control site in Nemea, Greece. The 7,665-pound (3,477-kilogram) GSAT 17 satellite also launching Wednesday is the heaviest Indian-built spacecraft ever built, according to Prakasha Rao, GSAT 17 launch campaign manager at the Indian Space Research Organization. Outfitted with C-band broadcast transponders and an S-band payload designed for mobile services, GSAT 17 will join 17 current satellites in India’s communications network. According to ISRO, GSAT 17 also hosts a payload to relay meteorological data and has a search and rescue support mission. GSAT 17 is designed for a 15-year mission, and will enter service in geostationary orbit 93.5 degrees east longitude following several weeks of orbit-raising and checkouts. The launch of GSAT 17 caps a busy June for ISRO after the successful inaugural orbital test flight of India’s GSLV Mk.3 rocket June 5, the largest launcher in India’s history, and the liftoff of 31 satellites on a Polar Satellite Launch Vehicle on June 23.